Hi! My name is Deb. We have a large family, and we all live in Atlanta: Mom and Dad, four adult daughters, four sons-in-law, and twelve grandchildren, ages 3 years through 13 years old!! We visit as a family, as often as we can, usually with a bunch of the grand kids, and have enjoyed our condo immensely! We want to share it with you, when we cannot be there. We hope you love it as much as we do. 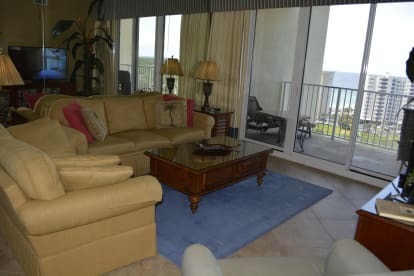 Our condo is family friendly and full of amenities and upgrades to make you feel as if you were at home, with the addition of a fantastic view from the balcony. Our view is completely unobstructed to the west, allowing for fantastic sunsets, full of every color you can imagine. The many variations of robin's egg blue, turquoise and lapis blue shading to deeper navy blue out in the ocean can be enjoyed from our balcony. And then there are the pink and purple sunsets! Come see for yourself.